What kind of donors should consider a charitable remainder trust? 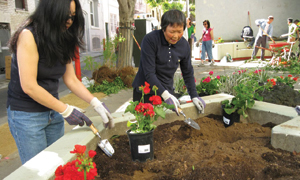 Donors who want income for life, bypass of capital gains tax on stock or real estate, reduced taxes, and the satisfaction of providing for a good cause like San Francisco Parks Alliance. First, a few words about charitable trusts generally. Anything you place in a charitable trust--cash, stock, real estate--is invested by the trustee to pay you income for the rest of your life and, if you wish, pay your heirs for life or for a term of years. After the death of all income beneficiaries, what remains in the trust passes to San Francisco Parks Alliance. -An immediate income tax deduction for a percentage of your gift. We will be happy to give you an idea of the size of your deduction. We simply need to know the ages of the income beneficiary (ies) and the payout rate of the trust. -No tax on the sale of appreciated property. From the donor's point of view, this is often the most important tax benefit. Sometimes thousands of dollars that would have gone in capital gains taxes remain in the trust generating income to the income beneficiaries. -The trust principal is not subject to estate tax. Property that might otherwise be subject to federal estate tax, which can be has high as 45%, is preserved from estate tax entirely. Appreciated real estate is often an excellent asset to place in a charitable trust. Mature investment properties are frequently earning only two, three, or four percent of their fair market value per year. When these properties are sold and the proceeds reinvested by the trust, earnings often increase significantly. Under ordinary circumstances, owners face substantial capital gains taxes when they sell rental properties or commercial real estate. In some cases personal residences are also subject to capital gains taxes even after the $500,000 exemption has been used. In any case, because your charitable trust will be selling the property, there will be no capital gains taxes due when the real estate is sold. Thus the entire net proceeds from the sale can be reinvested to produce more income for you. Gifts of appreciated stock are ideal for funding a charitable remainder trust because the stock can be reinvested by the trust for greater income while bypassing capital gains taxes at the time of the sale. A donor contributed 75% of a vacant lot into a charitable trust. When the lot was sold, about $70,000 came directly to her from the sale while $210,000 remained in the trust. Some of her $70,000 was taxable, but she used the income tax deduction generated by her gift to the trust to offset the tax due on the gain built into the $70,000 she received. There are two basic types of charitable remainder trusts. An annuity trust will pay you a fixed dollar amount for the rest of your life. A unitrust will pay you a fixed percentage of the trust principal each year, so if the value of the trust principal increases over time, your income increases with it. By law, your trust must pay you at least 5% of principal. You may choose a higher payout rate if you wish, but the higher the payout rate the lower your income tax charitable contribution deduction. Also, selecting the highest rate possible may not work in your best interests for another reason. If trust principal declines under the strain of meeting the higher rate, your income will decline with it. On the other hand, a lower payout rate may allow the principal to grow, and your income will grow with it. Additions can be made to a unitrust at any time, but you can contribute to an annuity trust only once. Finally, your trust must have a trustee. If you have an individual trust tailored to your circumstances, the trustee can be a commercial institution such as a bank or trust company, an individual with professional experience in trust management, a relative, or yourself. There are some complications in acting as trustee yourself, but it can be done if you understand and comply with IRS regulations. Parks Alliance will be happy to supply you with a list of on possible trustees or information on being your own trustee. There are many ways these trusts can benefit your heirs that we have not covered. But the first thing you should do is find out if a charitable trust makes sense for you. The San Francisco Parks Alliance will provide you with tax and income calculations tailored to your particular situation. This will give you and your advisors the information needed to make an informed decision as to whether a charitable trust meets your financial and philanthropic objectives. All information is provided confidentially and without cost or obligation. Our organization deeply appreciates your willingness to help us continue its work. For a personalized analysis contact the SFPA Development Office at 415.621.3260.